The Grosvenor House Apartments are part of the world famous Grosvenor House Hotel. This means you enjoy all the five services of that hotel combined with home from home feel of a high end apartment. On the 2nd floor is the 7 floors high Atrium, bathed in direct sunlight, designed to give guests the feel of an outdoor cafe within your own courtyard. Guests also enjoy 24 hour room service from a wide ranging international menu which includes cakes and snacks. Fully equipped kitchen including gas hobs, microwave, Nespresso coffee machine, cutlery and crockery, flat screen television with digital channels and PPV, IPod dock, safe, radio, dual line phone, DVD player, desk, ironing facilities, washing machine and dishwasher. The bathrooms do of course come with free top brand toiletries and feature a wet room. Two bedroom apartments available suitable for 4 and 6 adults. Penthouse suites have their own butler. Apartments have a daily maid service. Other facilities include a 24 hour gym, grocery delivery, luggage storage, shoeshine, babysitting, an onsite spa and complimentary WiFi throughout. Grosvenor House apartments are non–smoking throughout. Building has a lift. Nearest: Tube Station: Marble Arch 0.4 miles (0.6 km), Railway Station: London Marylebone 1 miles (1.6 km), DLR Station: Tower Gateway 3.5 miles (5.6 km), Motorway: M1 Junction 1 5.4 miles (8.7 km). Stay at the Grosvenor House Apartments and your staying in one of the plushiest most sought after districts in the UK. Where billionaires choose to make their London base and celebrities are always looking to be seen at, Mayfair. Located along the historic Park Lane and sitting opposite the even more historical and indeed iconic, Hyde Park. Your walking distance from major High Street shopping and major entertainment venues. Surrounded by the some of the best restaurants in the world. One third of a mile from Oxford Street, one of the most densely populated streets in all of Europe for retail shopping footage and stretching for more than a mile. Then there is the far more upmarket and exclusive Bond Street within half a mile, with its high end fashion boutiques and jewellery shops its where Londoners simply walk along for a taste of true high end. Here is where you will find Saville Row which has long had a reputation for the best handmade suits in the world. Marble Arch and Speakers Corner are 0.2 miles at the top (north) end of Park Lane. Marble Arch being a construction of three spate arches, made from white Marble in the 19th century and used for ceremonial occasions. Speakers corner where freedom of speech is practiced every Sunday morning when anyone with anything much to say and a soapbox will use this site as their platform. In centuries long ago this was the site for gallows and where many a man lost his life. All part of the rich historical tapestry of life that is to be found all over this part of London. Hyde Park opposite the hotel is a massive open area with dedicated garden areas, restaurants and a central Lake. Perfect for a relaxing stroll and forgetting you are in one of the busiest cities in the world. Just 3/4 of a mile south of the hotel is Buckingham Palace, home for the UK monarch and for the famous changing of the guards (change of shift for the Household Calvary). On a more practical level you are 0.3 miles from Marble Arch tube station and have 4 tube stops within half a mile. Bus routes run within the immediate vicinity of the apartments. Private parking is available in close proximity to the hotel and costs £60 per day. Jumeirah Lowndes Hotel: is 0.7 miles (1.1 km) away, has a guest satisfaction score of 88% and rates start from about £191. Carlton Tower Hotel (Jumeirah): is 0.8 miles (1.2 km) from here, earns a customer rating of 89% and base rates begin at about £256. Jumeirah Hotels have an average guest rating of 89%. The Jumeirah Grosvenor House Apartments with its rating of 89% is therefore not just well above average for this chain but is our highest rated Jumeirah hotel. Milesfaster ranking: 266th from 866 London hotels, 1st of 3 Jumeirah Hotels, and 99th of 131 five star rated hotels. Another to Consider: Also close by and a similar hotel (0.1 miles, 0.2 km) would be the 5 star Dorchester Hotel London, whose lowest rates start at about £750 and which has a 90% guest satisfaction rating. If your mainly looking at apartments maybe have a look at the Marriott Grand Residences Mayfair. It is 0.1 miles (0.2 km) with rates from £739 having scored a guest rating of 100% and has: free WiFi. Looking for lower base rates? Then another option might be the Grosvenor House (A JW Marriott Hotel). 0.1 miles away (0.1 km), has scored 80% from former guests and whose lowest rates start at about £341. Would you prefer to go with something that has scored higher in guest satisfaction ratings? If that is what your after then the 5 Star Marriott Grand Residences Mayfair seems like a possible option. The Marriott Grand Residences Mayfair is only 0.1 miles (0.2 km) away. The Marriott Grand Residences Mayfair has a perfect unblemished customer rating 100%, a truly stunning achievement. 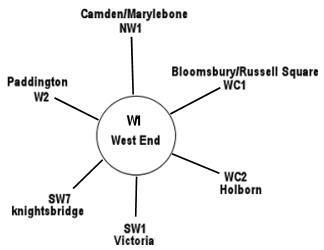 The fifty closest hotels from here (86 Park Lane, W1 postcode) that we have data for cover a 0.6 miles (1.0 km) radius. The 50 consist of 30 five star hotels (average rating 89%), 18 four star hotels (average rating 80%), 1 three star hotel (rated 61%) and 1 two star hotel (rated 70%). Of these hotels the highest rated are The Beaumont London (5 star), the Four Seasons Hotel Park Lane (5 star) and also the Lanesborough Hotel London (5 star) (all joint top with 99%). Base Rates: See how the area stacks up for low rates using base rates. We use published base rates but note these do not reflect special offers or short term discounts so remain a rough guide. We have calculated the average base rate for all the 50 nearby hotels at £304 per night. The low end of the scale shows rates from £49 at St George Hotel (3 Star, 61%) to a high of £1000 at 45 Park Lane Hotel (5 Star, 98%). Rate averages for each star rating: Five Star average: £403, Four Star average: £166, Three Star average: £49 and Two Star average: £79. We rank hotels based on their guest rating but balanced for their influencing factors and we rank Jumeirah Grosvenor House Apartments 18th (joint) of 50 nearby hotels and 16th (joint) for the 30 five star hotels in the area. Compared to the nearest alternative hotels this hotel is 46th of 50 (26th of 30 five star hotels.) for base rates. Balancing the hotels rates and user rating we rank the hotel 42nd of 47 when judging the balance of price point to user rating (The Arch Hotel was top).